Now here is a great thought! I received this "thought"today via a tweet from @MartinShovel many thanks too!It's actually a example of what the cartoon is trying to explain! What a marvellous staring point to develop writing with young language learners. 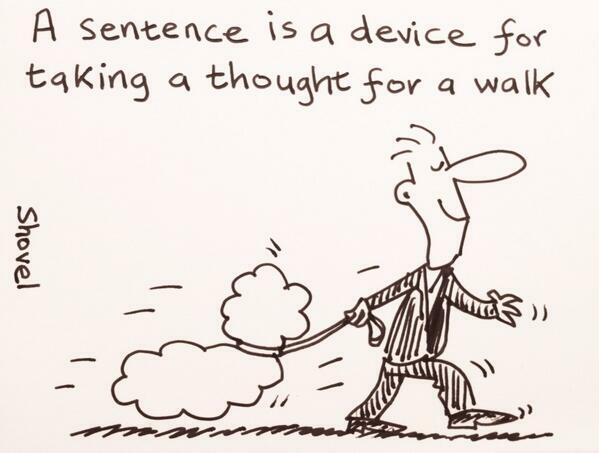 this cartoon and the ideas behind the cartoon link really well with early investigations of sentence structure.These blog posts help us in my opinion to get the young language learners to the point where they can take their thoughts for a walk as well constructed sentences. To construct a good sentence we need to develop free writing with accurate punctuation mind the gap and get writing . We can also practise and consider how we convey,receive and write messages via the activities based upon smoke signal messages writing for purpose smoke signals. Let's take our thoughts for a walk then! Start with free writing of sentences based on a class focus e.g likes/ dislikes/questions we want to ask other people/statements about ourselves.Just ask you children on rough paper or mini-whiteboards to create their own sentences of a focused thought! Let's put these into a frame or structured sentence. Remind them of punctuation and grammatical structure . Let's move the thoughts jotted on paper or mini-whiteboards that we have been working on and create spoken utterances that convey the meaning of our thoughts . Let's look at the split personality of a sentence and with a group of classmates convey the physical performance of the punctuation, the structure , the pronunciation and the meaning of our sentences. Let's share our sentences with the class by performing them for the class and therefore taking our thoughts for a walk! Now let's capture our thoughts as correctly written sentences that can be passed on to a partner who can understand what we have written and create a cartoon or drawing of the meaning of our written sentence.